Things are starting to get pretty chilly here in Chicago, so this weekend I chose to make a hearty and comforting dish. 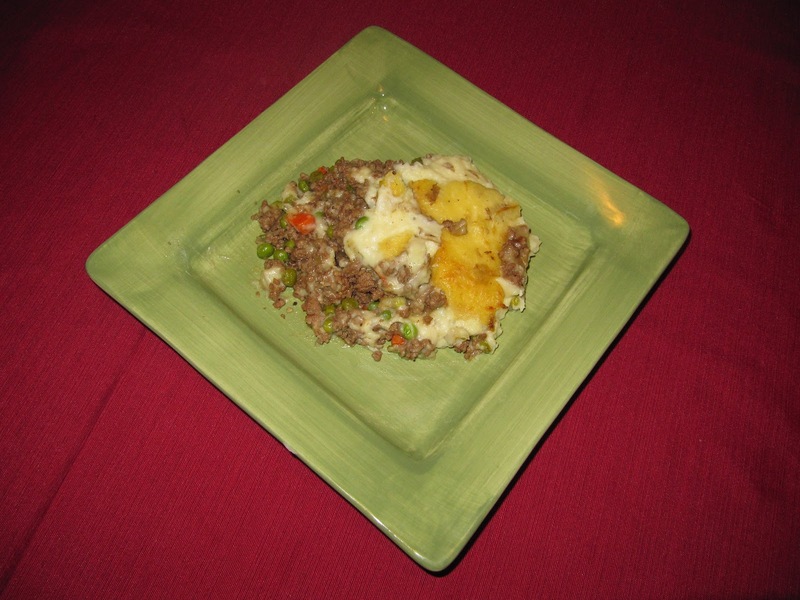 Shepard's pie seemed like the perfect choice. How can you argue with rich beefy goodness underneath mashed potatoes? For my version of shepard's pie I used ground beef and ground lamb. I used ground beef with a higher fat content to go with the leaner ground lamb. 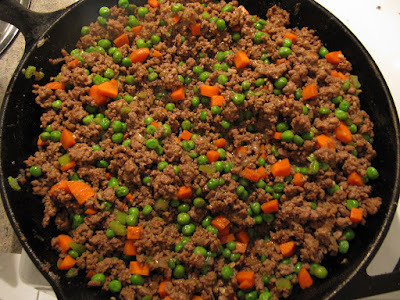 The rest of my ingredients for the filling were white onion, garlic, diced carrots, diced celery and peas. I began by sauteeing the ground beef and lamb with the onion and garlic until browned. I then added carrots and celery and cooked for a few more minutes. I used frozen peas so I stirred these in last so they can maintain their snap. I didn't want to begin cooking them so they can maintain their snap once out of the oven. 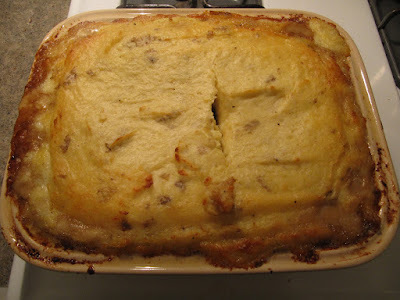 To thicken the filling one usually uses a brown gravy, for my version I decided to sprinkle a few spoonfuls of flour to the filling and stirred until it was incorporated. I then poured about a cup and a half of Three Floyds Black Sun Stout and cooked in the pan for a few minutes until slightly thickened. The coffee, chocolate smoky notes are reminiscent of an Irish stout but hoppier and can be a bit refreshing. This paired very well with the filling and complimented the rich beefiness. This is definitely a beer I should suggest, along with pretty much any Three Floyds beer (http://www.3floyds.com). For the topping I decided to go with do a cheddar mashed potatoes using 2 year aged white cheddar. I boiled the potatoes till fork tender and peeled about half of them. The reason I did this is because I wanted to keep some of the skins for flavor and texture but I also wanted to assure that the potatoes were relatively smooth and creamy. I mashed the potatoes with heavy cream, a couple of tablespoons of butter and a couple handfuls of shredded cheddar cheese. I mash/stirred this combination for a bit to get as many lumps out as possible. I poured the meat filling into a large baking dish. 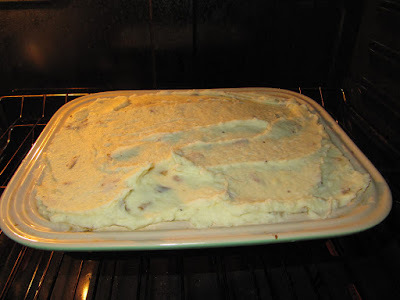 Using a spatula I evenly spread a layer of mashed potatoes over the meat and placed in a 350 degree oven for an hour. 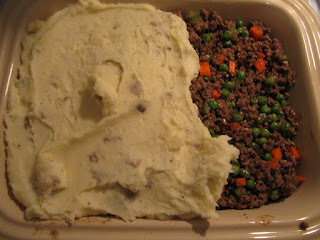 I cooked the shepard's pie uncovered in order to brown some of the mashed potatoes on top. This was a very filling and warming meal. The meat mixture thickened a bit and the stout imparted its flavor and richness. In addition to a good cheddar flavor, the potatoes formed a nice crust on top.